Sanctioned by USA Swimming through Virginia Swimming, Inc.
10 Lanes will be used for warm up. 8 Lanes will be used for competition. All 200 & Over events will be positive check in. Positive Check in will close at 7:15 AM for all positive check in events. Open to all Invited (MACH, YORK, OCCS & RMSC) registered Potomac Valley athletes and invited USA Swimming athletes that meet the event qualifying times. IMPORTANT: 14 & Under swimmers who attain a new age group between February 11th and March 1st may compete in any event where their time (1) is faster than the 14 & Under JO Qualifier “No Faster Than” standard for their current age group and also (2) slower than the PVS Junior Olympic “No Slower Than” standard for their new age group. This is to permit those swimmers who will be in a new age group at the PVS Junior Olympic Meet an opportunity to qualify. A contestant may participate in only his or her own age group events or in 14 & under events. Contestants must have equaled or be slower than the applicable qualifying times listed (no faster than times). A contestant may enter a maximum of eight (8) individual events and no more than three (3) individual events per day plus one (1) bonus event of 500 Free or 400 IM. Swimmers shall compete at the age attained on the first day of the meet. "No Recall" procedures will be used at this meet. 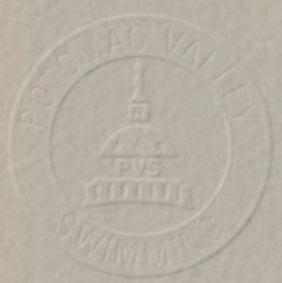 All certified officials wishing to volunteer to work this meet please contact the Machine Aquatics Officials Chairman, Pam Starke- Reed at ps39p@nih.gov prior to February 1, 2008. Please include your club affiliation, certifications held, and sessions you wish to work. Officials assigned to this meet should sign in at the computer table at the start of warm-up. Certified officials who have not been contacted should volunteer their services to the Referee. All events 200 yards or longer will be deck seeded. 100 yards events may be deck seeded. Athletes who check in to a deck seeded event, have been seeded, and fail to swim the event will be barred from their next scheduled event, unless excused by the Referee before the event takes place. Coaches are responsible for the conduct of their Swimmers and Families and for cleaning up their team areas. Parents not working the meet as a deck official, volunteer lane timer, or other meet position are not permitted on deck. Only athletes, USA Swimming certified coaches, and deck officials permitted on the pool deck. Coaches & deck officials are required to display their current 2008 USA Swimming card. There will be no awards at this meet. There is no admission charge. Programs for each session will be available for $2.00 each. Working officials and coaches receive a complimentary program. Snack Bar will be available at the meet. Include with your commlink file one (1) report by name and one (1) by event. Create these reports in Team Manager and save as Word for Windows files. In the body of your e-mail provide entry numbers (girls, boys, totals). Include contact information (e-mail, phone, officials contact). Entries may be sent via mail/express mail/ etc. Computer disk entries (Hy-tek) are encouraged. Disk entries require one (1) meet entry report by name and one (1) by event from Team Manager. Entries may also be submitted on a PVS Master Entry Sheet. All entries must include a completed "Entry Cover Sheet". Note, It may be necessary to limit entries therefore, entries will be accepted on a first-come, first-entered basis until the meet fills up. Late (deck) entries are $10.00 per individual event and must be submitted no later than 30 minutes prior to the first event of each session. Swimmers will be first entered into open lanes in existing heats on a first come, first served basis. No new heats will be created. In the event of an oversubscribed session, the Meet Director reserves the right to not accept late (deck) entries.